Polygamy refers to a system of 'marriage with more than one person at once'. The opposite of polygamy is monogamy where each person has a maximum of one spouse at any one time. In Bangladesh, Muslim men can practice polygamy. It has been reported that in Bangladesh the number of polygamous Muslim men with more than one wife has been increasing. Such increase is due to the fact that the laws of Bangladesh (specifically, the Muslim Family Laws Ordinance 1961) allow Muslim married men to keep multiple wives. The Muslim Family Laws Ordinance 1961 was said to be enacted as a result of active lobbying by All Pakistan Women's Association in 1950s to restrict polygamy in Pakistan (including East Pakistan, now known as Bangladesh). However, the effect of the said Ordinance turned out to be quite different. The Muslim Family Laws Ordinance 1961 has rather legitimized male polygamy in Bangladeshi Muslim society. 2. … (such) application form … shall be submitted to the chairman (of the arbitration council)… and shall state the reasons for the proposed marriage and whether the consent of the existing wife or wives has been obtained thereto. 3. On receipt of the application … the Chairman (of the arbitration council) shall ask the applicant and his existing wife or wives each to nominate a representative, and the arbitration council so constituted may, if satisfied that the proposed marriage is necessary and just, grant, subject to such conditions, if any, as may be deemed fit, the permission applied for. Therefore, it is clear from the above legal provisions that a Muslim man in Bangladesh can legally have multiple wives if he can satisfy the Arbitration Council with 'necessary and just grounds' for such marriage. Further, section 6 of the Muslim Family Laws Ordinance 1961 neither makes it necessary nor a sufficient condition for the husband to have consent from his existing wife. The existing wife only has a right of representation before the Arbitration Council. It is stated that her decision to give consent to her husband's plural marriage is only a factor before the Arbitration Council to find out whether the husband can remarry on 'necessary and just grounds'. Law has never tried to define what could possibly be 'necessary and just grounds' in this regard. Therefore, it is stated that the Arbitration Councils are left with a wide discretionary power to deal with the issue of polygamy in Bangladesh. Further, the discussion on polygamy in Islam and the relevant recommendation made therein, as accorded in the High Court Division judgment, was ordered to be deleted as the Appellate Division feared that it might create confusion in the minds of the subordinate courts and the people at large. First, the doctrine of judicial precedent followed in any common law country (including Bangladesh) empowers the judges to make laws by deciding cases before the court. Judicial decisions of any common law court consist of both 'ratio decidendi' (rational behind the decision) and 'obiter dicta' (an incidental remark or observation; a passing comment). Though ratios are binding, the obiter dicta only have got persuasive authority. Therefore, the High Court Division's incidental observations regarding polygamy in Jesmin Sultana Case cannot be said to be totally of no importance. Second, it is a well-known belief that in a common law country, the judiciary follows 'adversarial system of justice' where it plays the role of a 'mere umpire'. However, in today's world, judicial activism has been welcome in many developing countries including those of South Asia. In Bangladesh also, the High Court Division of the Supreme Court of Bangladesh under its 'inherent power of jurisdiction' made a series of remarkable 'suo moto' decisions to meet the end of justice, without there been any petition or conflicting parties at all. [For example, State vs. Deputy Commissioner of Satkhira (1993) 45 DLR 643.] Those decisions illustrating the activist role of the judiciary against violation of human rights were always welcome by the Appellate Division. However, it is not understood why the Appellate Division every time becomes unnecessary critical when similar activist role is played by the High Court Division concerning the issue of women in Bangladesh. In this regard a reference can be made to Hefzur Rahman v. Shamsun Nahar Begum. 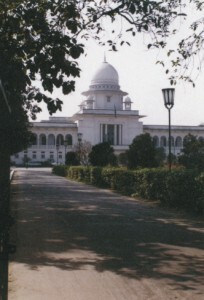 In this case the High Court Division of the Supreme Court of Bangladesh decided that- '… a person after divorcing his wife is bound to maintain her on a reasonable scale beyond the period of iddat (three months) for an indefinite period, that is to say, till she loses the status of a divorcee by remarrying another person'. The Appellate Division of the Supreme Court of Bangladesh reversed the above High Court decision rejecting the liberal interpretation of Muslim women's rights forwarded by the High Court Division. Third, the Appellate Division feared that the High Court decision on legal polygamy would create confusion in the mind of the subordinate courts. However, it did not explain why and how it might create such confusion. The role played by the higher judiciary in interpreting legal provisions is of crucial importance to the lower judiciary. However, if the flow of liberal interpretation of religious laws is obstructed, it is doubtful how these laws can be developed to meet the need of the time. Finally, the issue of polygamy should not be limited only to a matter of religious interpretation. There can be other aspects of interpretation to the issue of polygamy, which the Appellate Division failed to adequately address and/or appreciate. The notion of polygamy gives rise to many aspects of national life of a state, such as social, economical, psychological and the overall personal security issues of women in the society. Even the widespread incidences of torture, both physical and mental, against women for dowry and the series of continuous domestic violence inflicted upon women are some way or other related to the questions of polygamy. As Muslim men in Bangladesh are allowed more options to wife, the value of women becomes insignificant to them, for they know even if one wife is dead, there will still be others. The author is an Assistant Professor of Law at BRAC University School of Law and the Executive Director of LawDev (Bangladesh).